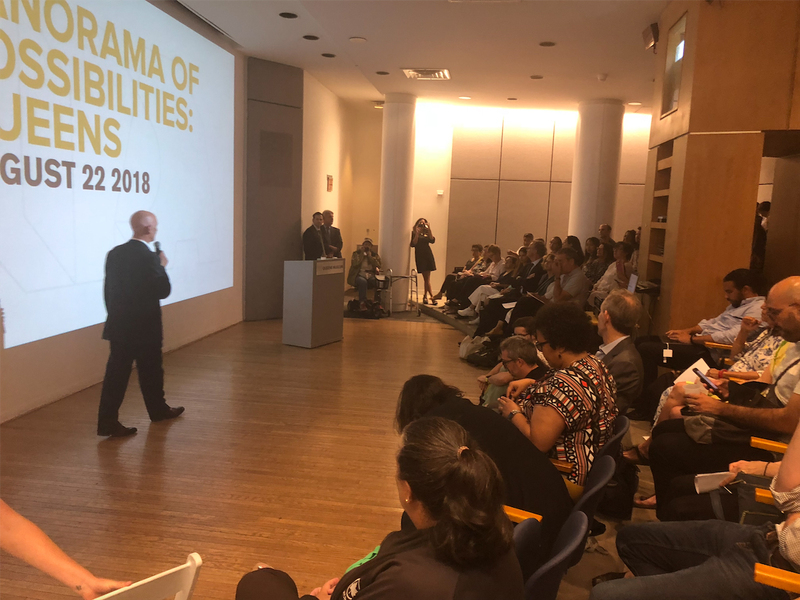 The Institute for Public Architecture has just finished its third biannual summer residency fellowship, Panorama of Possibilities: Queens, with final presentations having been held on August 22 at the Queens Museum in New York City. The 13 fellows, all mid-career architects and designers, have worked in seven groups to propose futures for a democratically-developed Flushing, Corona, and Willets Point. The night’s presentations began with a focus on sociological and interpersonal experiences of people’s homes and daily commutes. By the end, the presentations had moved towards a community-wide, cultural reworking of the public as an active stakeholder in its own parks, neighborhoods, and Business Improvement Districts (BIDs). The first group examined accessory dwelling units as a way to increase access to affordable housing by reimagining a structure that is already ubiquitous in Queens. The second group responded to the prompt, “I am willing to share ____ with ____,” to explore and question our understanding of the home and ways of introducing new models of multi-generational housing. The third group sought to challenge normative ways of urban design and created an interactive board game that allowed individuals to voice the changes they would like to see in their own neighborhoods. Another looked at the effects of development on specific opportunity zones and on children growing up in these communities. One fellow considered ways in which Flushing Meadows-Corona Park could be made more accessible and be better integrated into the community. Yet another investigated possible futures for Willets Point’s automotive industry. Lastly, a group proposed a new vision for BIDs that would support multifaceted “cultural commerce” rather than just retail in order to support social service providers and small business owners of all kinds. There was an amazing turnout of architects, designers, community members, family, and friends in the audience. Those who had seen previous preliminary presentations remarked on the rigor and scope of each project and their tremendous development over the course of the six-week fellowship.